* Replaced the tiny G.I. sights with a set of MGW 3-dot sights - in consideration of my aging eyes. * Replaced the trigger with an actual G.I. surplus short stamped and welded trigger. I find these to be the best looking and feeling of all 1911 triggers, and they give you more trigger-finger room in cold weather if you're wearing thin gloves. * Replaced the trigger/sear/grip safety leaf spring with one from Cylinder & Slide which brought the trigger pull down to 4-1/2 pounds consistently. * Replaced the recoil spring plug with one that duplicates the earliest spring plug used on 1911 pistols, with the difference being that the spring plug, near the closed end, has a little divot punched in it so that it can be "threaded" on to the recoil spring, making the plug captive so that if it slips during field strip or reassembly the spring plug doesn't get launched off into low earth orbit (Although I find that in practice I arrest its flight with my left eye.). This feature was actually eliminated to save time and simplify things for wartime production. 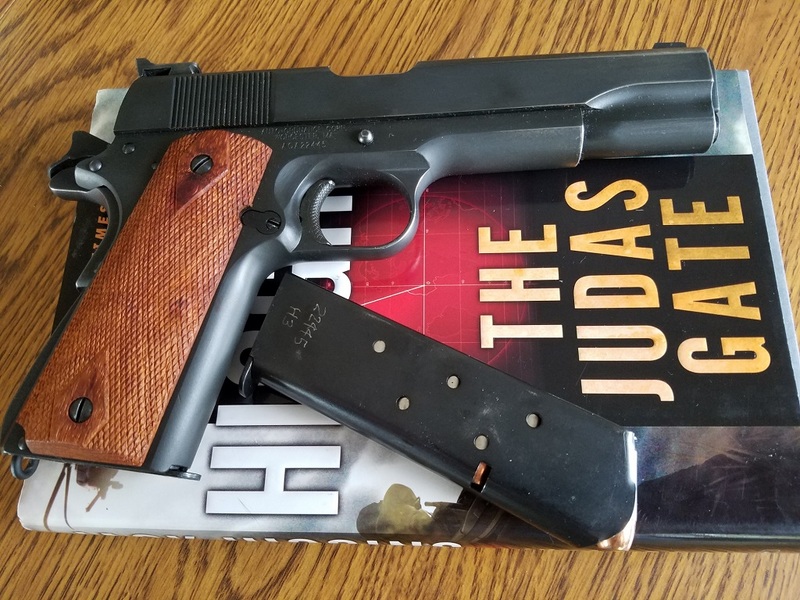 * The grips are obviously not stock, but are a set that I had stashed in my "Big Rubbermade Container Of Gun Stuff" - I think they came from Brownells back when they started making grips under their own name. I like the lighter color of wood against the parkerizing. Sometimes, though, I will sue a set of Pearce rubber grips. Just depends on my mood. * I tightened up the fit of the barrel bushing to the front of the slide, just because I wanted a little bit less gap - As it was the gap was in spec, but I just like the looks of a tighter fit. 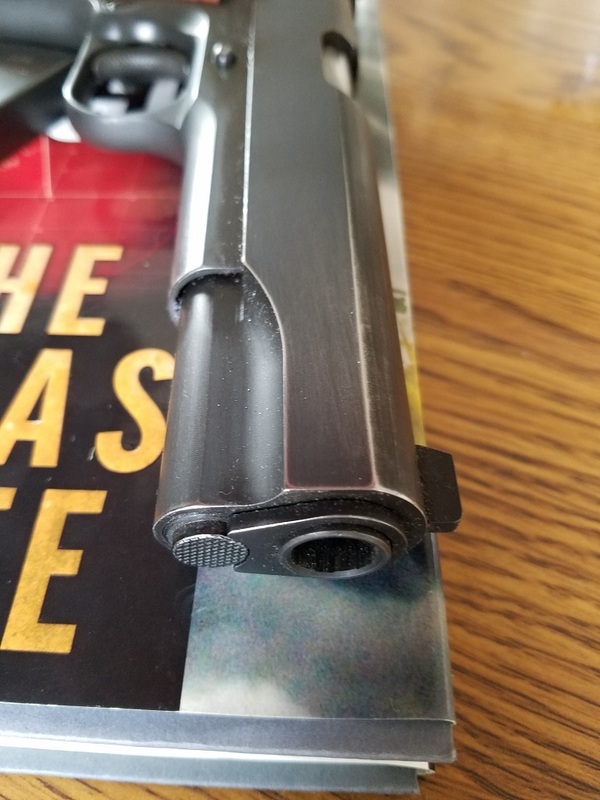 As to adjustments to the pistol itself, I was having a slight issue on magazine insertion with the rim of the top cartridge in the magazine catching on the top of the rectangular "window" inside of the rear of the magazine well. I corrected this by detail-stripping the frame and using a small Swiss precision file to "break" the sharp corner at the top of the window. All is well now. For magazines, I prefer Checkmates, as for years they have been the OEM supplier to Colt's. I stick with 7-rounders, because I find that 8-round magazines, the flush-fitting ones anyway, can't be fully inserted if the slide is in battery. 8-round mags would work if you always shot the pistol empty before each magazine change, but for defensive use where you might like to top up a pistol with a fresh full magazine while there was still a round in the chamber, there's just not enough room. This is true on my Colt 1911 as well. Normally I don't use rubber bumpers on my mags, but I'm going to use this pistol in a IPSC "clinic" at my club at the end of the month, and I thought I'd try them out. Most likely after the clinic the bumpers will come off, as for concealment I prefer my mags to be flush-fitting. I'm one of the oddballs that actually likes the "small button" original G.I. safety and the G.I. grip safety tang. Lately, though, I've been trying to retrain myself to use a high-thumb position with my thumb resting on top of the safety, and after shooting about 150 rounds yesterday I have two little "fang marks" on the web of my hand - one from the top rear corner of the safety lever and one from the grip safety tang. I may go back to a low-thumb position. Yesterday I shot a bunch of Speer Lawman 185 grain Gold Dots through the pistol, using new Checkmate mags with the Hybrid feed lips, and they worked 100%. I had been carrying the pistol with Remington 185 grain subsonic JHPs, but I decided I'd step it up a little with a round giving a bit more velocity. The Gold Dots have a muzzle velocity of 1050 fps, and you can feel it in the recoil. But that's the best thing with .45 ACP - it hits hard! I am totally satisfied with this pistol. The finish has held up well, showing just enough holster wear to give it that "experienced" look. It has been 100% reliable, and plenty accurate for it's purpose. It is my most-often carried CCW pistol, giving up its place once in a great while to a Hi Power or a CZ75B. I always carry it in an El Paso Saddlery "Summer Comfort" leather IWB holster, and it's all-day comfortable. Slide to frame fit was great right out of the box. Recently I was shooting on the same range as a guy with a new Colt's Gold Cup .45ACP, and he asked what I shooting. So I handed him the AO and told him to look it over, but not to look at the manufacturer roll mark on the frame until last. He looked at the slide to frame fit, the finish, and just the general appearance of the pistol, then looked at the rollmark. When he read Auto Ordnance on the frame you should have seen the look on his face. He said he was thinking it was a custom-built pistol. I can't think of a higher complement. Last edited by tpelle; 01-05-2019 at 01:08 PM. I like it! The sights grabbed my eye immediately. I can’t see much of any wear that you spoke of, but do like the “honest wear” look. Sounds like it doesn’t sit around gathering dust, so I’m sure it will continue to age gracefully. Thanks forr sharing! The last two pictures show the details of the WWII G.I. surplus stamped and welded trigger. They call this checkered, but the checkering is more of a suggestion than it is a fact, as the checkering lines can't be felt by the trigger finger. But that's exactly how you would want it, in my opinion. 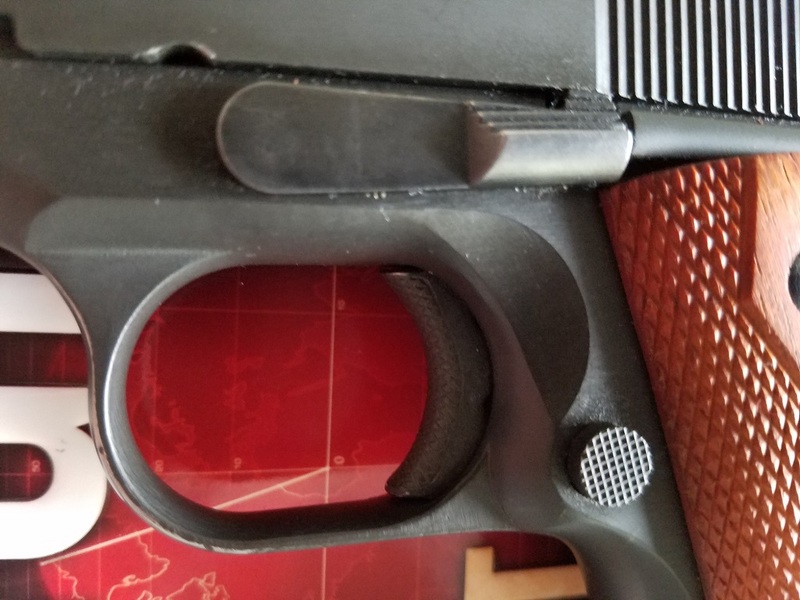 Also, if you look carefully in the last picture at the worn area on the bottom and front of the trigger guard, you can see two little dots at about 7:00 and 9:00 O'Clock where the finish did not wear. Those dots reveal the presence of a couple of tiny pits, which confirm to me that this is a cast frame. The pits being bubbles that remained in the cast steel. Otherwise you really couldn't tell that the frame is cast. Anyway, it's a non-issue to me. Oh, and I removed the magazine bumper pads, which I had installed in preparation for a Practical Pistol clinic that was scheduled for yesterday. However it was cancelled due to temps being in the low to mid 20's F and predicted snow, and the fact that the gravel surfaces in the pistol pits would probably be holding ice due to the recent snow and the freezing and thawing that's been taking place. The PTB at the club took the decision that people with loaded guns running around on ice might result in a less-than optimal outcome. Good Choice, that was! I carry with a flush magazine but have bumpers on my 2 spares. I been running Wilson 8 rounders for years. Never an issue. I like the GI guns. I would probably like having the thin bumpers, but eery place I've seen bumpers for sale they come with one thick and one thin. Does anybody sell just the thin bumpers? I have to say that this is the first time I’ve seen that trigger, and I like it. In the first couple of the recent shots I thought it was carbon fiber. Very nice, appearance wise! I like that trigger too, but when I tried one it pinched my finger, being so close to the frame. I put the OEM trigger back in. I prefer an alloy framed 9mm commander from Fiilpino parts and an 80% frame. The .45 ammo costs too much and the GM is too big and heavy. This commander is a great practice gun for the actual ccw, which is a Sig P938. None of the pocket 9's have anything like the durability needed to withstand the needed 5000 rds per year of practice. So put the wear and fouling on something other than the actual carry piece and you'll be way ahead. The Sig in the kydex pocket holster looks like a wallet, and the user can have his hand on the gun, without anyone noticing, if he "smells a rat", and then have a CCW draw that's at least 1/4 second faster than anyone's ccw belt rig draw. It's more like 1/2 second faster than most people, for a fact. Half a second is time enough to get one more chest hit and brain him, or hit 2 of his buddies. Also, in cold weather, a belt rig requires you to clear TWO outer garments, with a great deal more likelihood of a fumbled draw, bad grasp of the gun, etc. The pocket rig can just be palmed from pants pocket to coat pocket. A bit of velcro in the coat pocket holds the rig where it should be. So if you're going to hang up the coat when you go inside, move the rig to your pants pocket. Reverse for when you go out. If you keep your hands in your coat pockets, no need of gloves, eh? :-) A slit in and protuberance upon the Kydex pocket holster will preclude the safety's being disengaged in the rig.